A melee before breaking loose. All photographs courtesy of OXUSfilms. Zooming in on the action. Zooming in on the horses. On the way to Buzkashi. 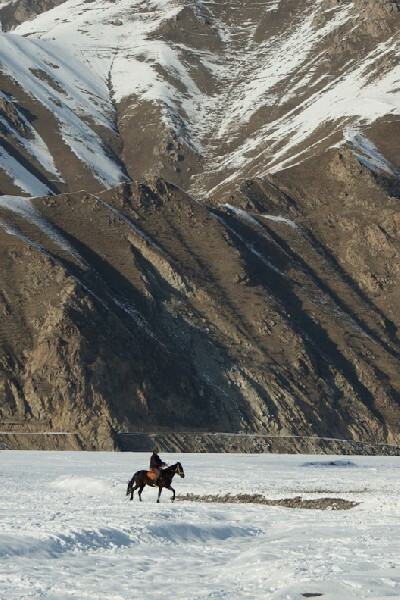 A herder in the mountains. 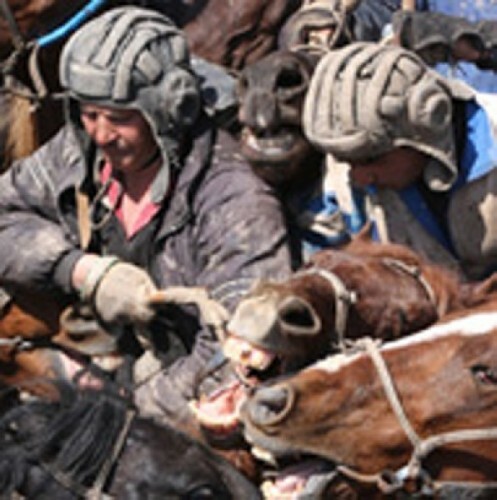 A recent radio interview with director Najeeb Mirza of OXUSfilms caught our attention and so we went to see Buzkashi! at the intimate MoCA Cinema Lounge along with approximately 100 other viewers and were delighted with the experience. Mirza was appointed for three years to the Canadian Embassy in Almaty, Kasakhstan, from where he covered the five Central Asian states. 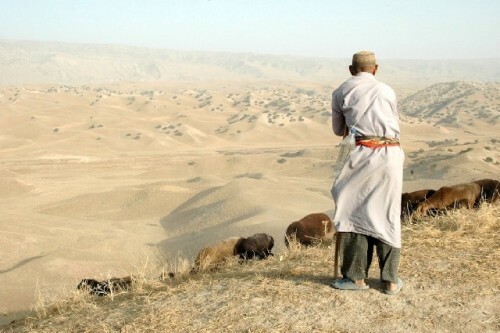 While traveling in Central Asia, which include also Afghanistan, Kyrgystan, and Uzbekistan, he fell in love with the land and its people and started photographing and filming. 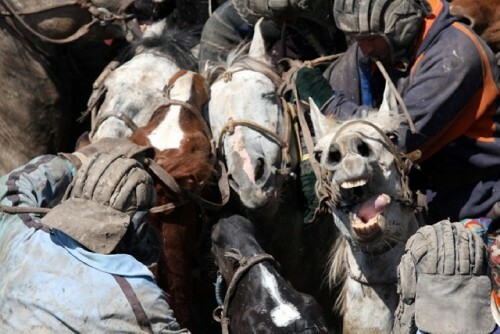 Meanwhile, Buzkashi! is his fourth film of the region. 180 hours of film materials are left and, as he put it, a possibility for several other vital stories to tell. 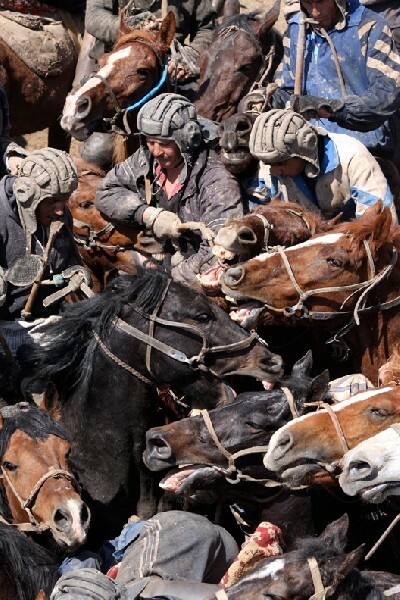 The film opens with a mass of men on horses, wrangling with each other over what will only much later be seen and only occasionally, a headless goat. 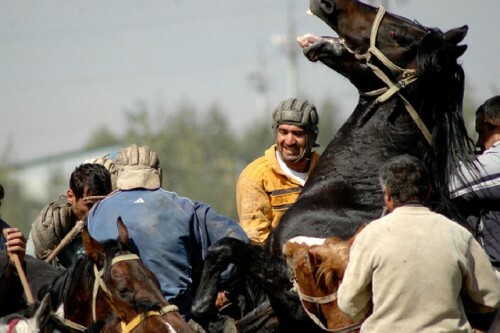 The carrier of the goat has to break free from men and horses and ride through two goal posts in order to be the winner of a run. In the course of a day or weekend there will be many wins and prizes. Each win will bring a prize, ranging from sheep and goat to even a Mercedes Benz at major games. 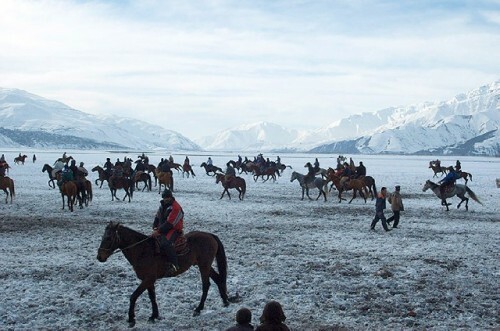 During the colder seasons, there are Buzkashi games every weekend, which are sponsored by wedding parties and local governments, even though Buzkashi is officially banned. (Go figure!) Younger players ‘practice’ and win smaller prizes at less important games. 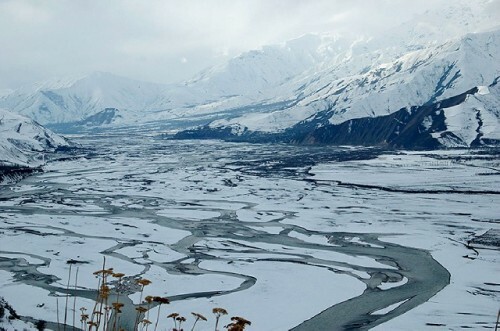 The landscape of the Pamir Mountains is vast, brown and harsh, or laden with snow in winter. The cinematography is breath taking! Two of the main characters, Azam and Azkar live in the country side, while Khurshed, the rich guy, also maintains a city life. And so their attitudes toward the game vary accordingly. 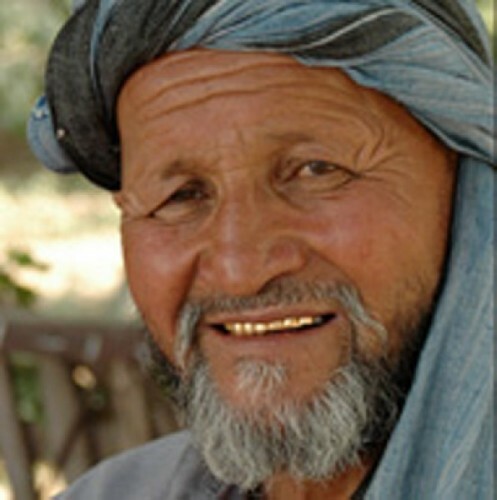 Azam owns a large herd of animals, sheeps and goats, a few horses and maybe a mule or two. 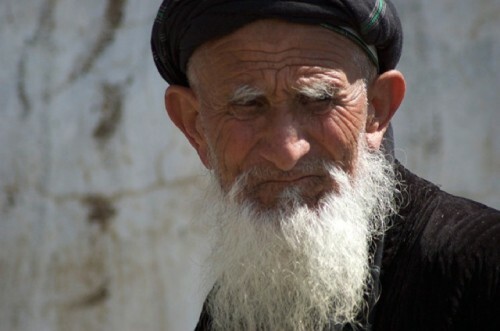 He has responsibilities for a large family, living in an extensive compound: Two wives, ten children, his parents and brothers and their families. 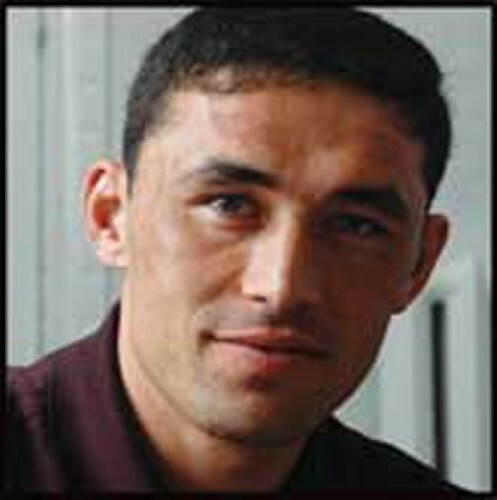 Azkar has a young family, one child and appears to be less fortunate. Both of these men rely on sponsors, who provide them with a string of horses during the games. A winning horse and rider make the horse more valuable, and so sponsors support the best players. The winners share their prizes with their sponsors. A chapandazan (player) readies himself during a ritual of getting into protective gear. It involves layers of clothing on feet, legs, bodies, fingers, gloves and finally old military tank helmets. Tajikistan belonged to the Soviet Union. At some point during the film we realize that Azkar receives bad news from his sponsor via cell phone. 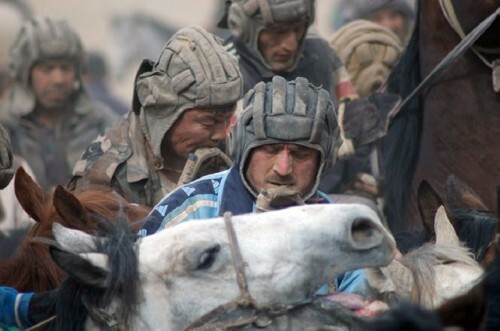 He lost the sponsor and in order to continue with Buzkashi, he became friends, formerly enemies, with Khurshed. The rich Khurshed employs up to 15 riders, who will support him during a game as blockers and runners, in order to keep other chapandazan away so that he will win. Now, Azkar has become one of the entourage and half his village is angry with him. After all, the most prestigious win is gained without hired support. Games used to be played for honor and with individual integrity, not for material gains and ego gratification. Those were the old rules! Khurshed, who has his own stables and supports the international rules: Groups of players compete with other groups. The film shows a clip in a sports studio in the city with western equipment, where young players are being trained. 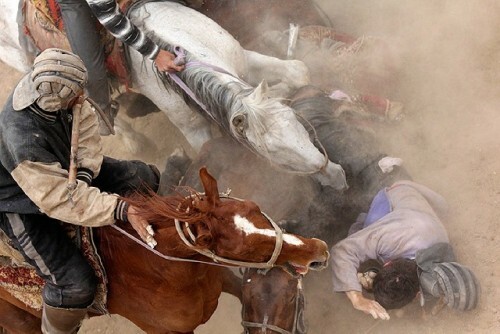 That is progress and Azam believes that it will destroy Buzkashi! Azam was the only one, who allowed the film crew into his life. The viewer can see short glimpses of his wives, one assured us that she married for love. We watch his children trying out Buzkashi with their father, another time on a bazaar trip buying clothes for the new school year. Early in the film Azam expressed that his oldest son, Tahir, should take over the herd and farm one day. The young teenage boy, however, wants to become a doctor and we see him, finally, entering a school in the city with his father waving good-bye. Azam has relented, as long as the boy does not become a lawyer! Well, the audience laughed. We also learned that Azam became a Buzkashi player by chance. His brother was murdered by a war lord after the Civil war ended in 1993. His body was never found and the family remained very distraught for a long time. 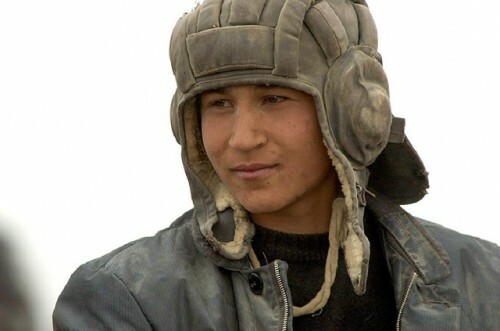 He participated in a Buzkashi game to honor his brother and won, which lifted the heavy sadness from his father, and therefore from the family. 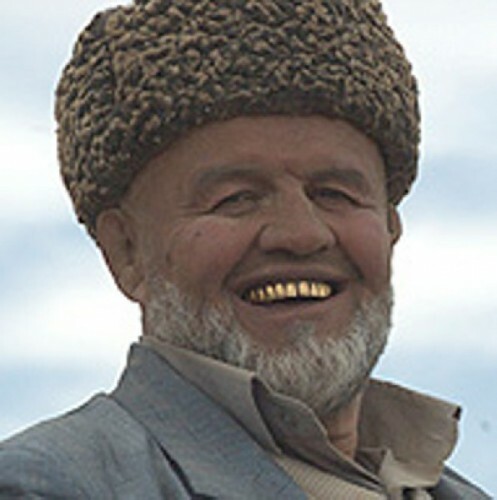 Over time, Azam became the champion from Kurgan Tube District. Throughout the film scenes change quickly; the game is speedy and dangerous. And little by little the viewer experiences the human stories as well. There are wonderful moments, when children put down their open, home-made skateboards with wheels in four corners, and sled down a hill. Or, when the men kneel near a shrine and pray on a mountain top. 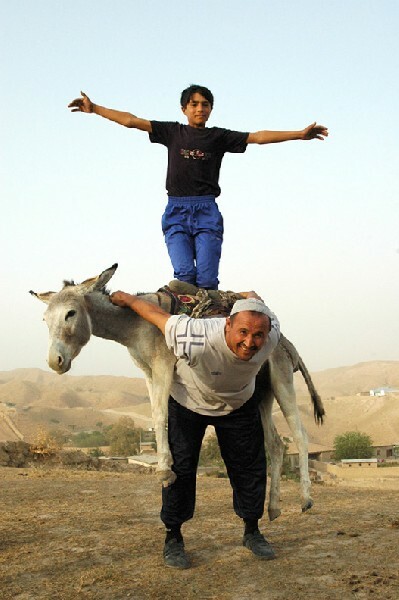 The film follows Azam, the protagonist, during training exercises by lifting a mule, dumbbells or boxing with an assistant. He is a strong man, in his forties perhaps. Najeeb, the director, gave cameras to the ‘actors’ and had many small helm cameras attached to riders, horses and goal posts. At some point a crane filmed the action overhead. Early on he encouraged participants to film themselves, in order to win their trust. 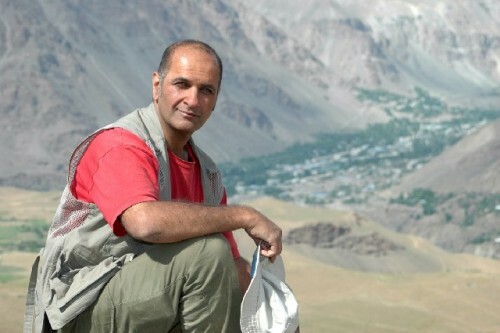 For two years, Najeeb and crew traveled to Tajikistan several times per year, each time filming for a month. And, as he said, interfacing footage was cut and now beg for their own film. 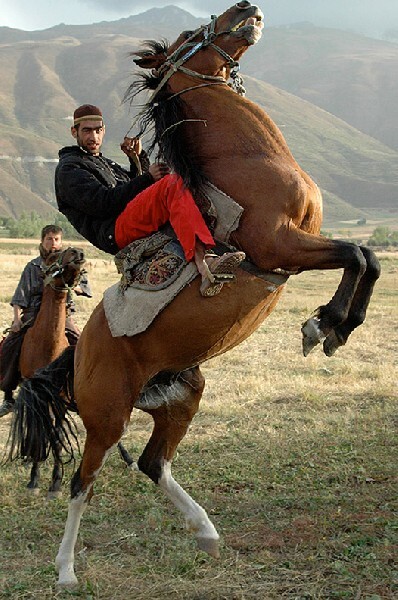 BUZKASHI! was premiered in April 2012 during the Toronto Hot Docs Film Festival and has been seen in a number of independent documentary film screenings in Canada and the USA. 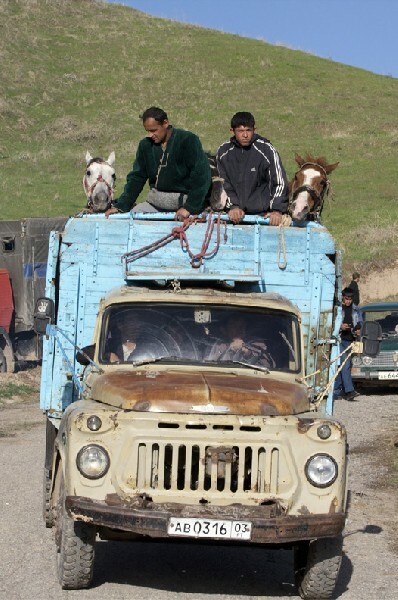 Actually, one can see at OXUSfilms a trailer or the entire movie of: Buzkashi! (trailer only); The Sweetest Embrace: Return to Afghanistan; Falak, Song of the Soul; and Herders' Calling (trailer, film in the future). Najeeb asked the audience to ‘like’ their Buzkashi Facebook page. Then, look for a show near you! "Corinne Varon-Green Astrid, Nicely written with vivid descriptions that put me on the edge of my seat! Fascinating info about a part of the world that we/I know very little about! Thanks for sharing." "Astrid, thank you for introducing a whole new culture to us. Very intriuguing and thought provoking re the happenstance of where in the world we were born. "